man-made object, according to the United States Air Force. East Coast Sunday night was not a result of a man-made space object. The Joint Space Operations Center tracks more than 19,000 man-made objects in space, but no natural phenomena. exact path the space junk was traveling over the eastern seaboard. the object was a rocket tank with residual amounts of booster fuel. The flashes and booms that people heard prompted calls to 911 and the National Weather Service late Sunday night. continue to inquire as to the cause." earth's atmosphere and bursting apart. Like you wouldn't believe. And it went on and on. The house shook like I've never experienced." that featured a smattering of both. to the line of thunderstorms passing to the north at the time. some 30 seconds after the flash. result of particles smaller than a pea entering the atmosphere. the International Space Station last Thursday, crashing back to earth. into several pieces as it went. But only one person has said he saw where it landed. Joe Butler of Suffolk says he was driving south across the Chesapeake Bay Bridge-Tunnel when night turned briefly into day. "It shot right over my car, it went down in the water right between the two bridges." widely. The meteor, he said, splashed into the water between them. know, babe, I think that was a falling star.' "
The meteor flashed past Hampton Roads around 9:45 p.m. Sunday, briefly lighting up the landscape. debris, said it couldn't have been. was really, really white with blue flames. It was pretty wild." but he could see the splash when it landed. He saved the newspaper accounts for his 5-year-old daughter to read when she gets a little older. Her main concern at the moment, he said, was whether dad had made a wish on the falling star. Just for the record, no, he didn't. air forces monitoring the area. devastation as a result of North Korean missiles. involvement in the weeks events. Comment: We here at SotT would like to propose that these sonic booms and lights in the sky could also have been meteorites. the last year with a high percentage of these in the last few months. quotation marks) to bring up a few more. satellites should change as a gravitational wave passes. driftwood in a motorboat's wake. nearby, creating a distinct signature in the data being collected. used to determine the mass of passing asteroids. When an encounter with a known asteroid shows up in the data, scientists will already know its trajectory. of a few binary asteroids observed from Earth," he added. "We always wonder about the porosity, the density, and this will give us measurements from additional asteroids," he explained. Tricarico also has predicted the number of potential encounters with smaller, unknown NEAs. sizes in the NEA population. Cork and even from up as far as Donegal." mug. But they could be larger." Chapelhall, as previous witness reported. from inside house to garden, expecting to hear a bang or whatever? Again I am/was a non believer. Flight Center in Greenbelt, Md. 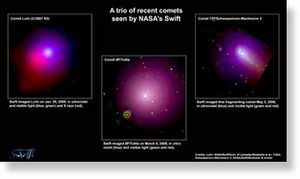 image galaxies, and study comets. of a study led by Jenny Carter at the University of Leicester, U.K.
Earth in 2006 -- and 8P/Tuttle, which rounded the sun in January 2008.
spot' where many key comet gases strongly emit." powers as high as a billion watts. Holmes, and it was too bright to study its ultraviolet spectrum." 800 gallons of water a second when Swift observed it. "Someone calculated that's equivalent to $17,000 of bottled water each second," Villanueva added, smiling. growing brighter, then dim again before disappearing over the horizon. What is unusual about this sighting is what happened next. The object suddenly reappeared, and shot back up into the sky, following the same path as when it had descended. Witnesses reported that the object was traveling at a high rate of speed in both directions. south-southwest path until finally disappearing from sight. A "unique" micrometeorite found in Antarctica is challenging ideas about how planets can form. chemical composition unlike any other fragment of fallen space rock. This, say experts, raises questions about where it originated in the Solar System and how it was created. It also means that astrochemists must expand their list of the combinations of materials in planetary crusts. half the width of a written full stop. Solar System and planetary formation. MM04 was a basaltic achondritic micrometeorite, said Dr Smith. Solar System's early days before material had accreted into planets. has utterly transformed the nature of, say, Earth rocks. extra-terrestrial material that routinely arrive on Earth anonymously." For Dr Smith, the excitement of MM04 lay in the mystery of its origins. Moon and Mars," said Dr Smith. "But [MM04's] chemistry does not match any of those places," she said. "It has to be from somewhere else." processes must be expanded, said Dr Smith. Jacksonville, Florida - A number of First Coast News viewers say they saw something spectacular in the sky Tuesday night. "An asteroid just went blazing through our backyard in Neptune Beach,"
was going to hit a house." Julia in St. Augustine saw something similar over State Road 206.
smaller fragments may have landed somewhere west of Crescent Beach. Once in a lifetime sight!" People in Middleburg saw it as well. bomb or missile (especially after all of this North Korean news)." Cindy Hawkins just pulled into the driveway of her Middleburg home with her children. An amateur stargazer has discovered a new comet, becoming the first South Korean to do so, science authorities said Wednesday. and a digital camera on March 26. Solar Heliospheric Observatory spacecraft from March 29 to April 4. 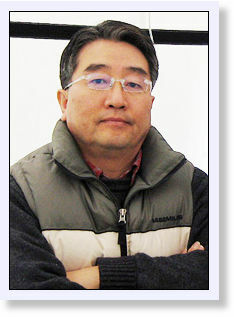 The International Astronomical Union (IAU) gave credit to both men in naming the comet Yi-SWAN. 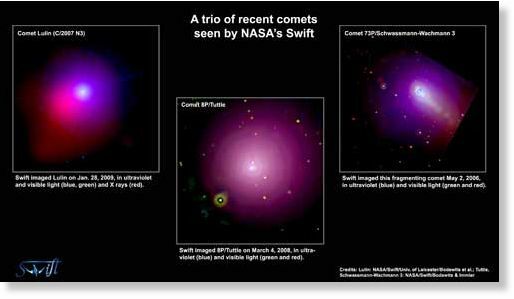 Yi-SWAN is one of more brightest comets found at present, with a magnitude of 8.5 allowing it to be seen by small telescopes. The comet is currently in the constellation Cassiopeia, but is expected to move to Perseus by the middle of this month. England: Did you see a meteor? A meteor has been spotted above Rutland. Andrew Shirley, of Willow Close in Uppingham, spotted the bright light above the town on Sunday at about 8.10pm. Back in October there were other reports of a similar sighting over the town. Comment: There was also a fireball seen in Ireland on Sunday at 1230 BST. Rapida Reaccion - F.U.R.A) to see if they have any details on the case. Comment: For those who are unfamiliar with the term "aerolith", it is a meteorite consisting mainly of stony matter. walking over Chevron Island, which is located in Goldcoast Q.L.D. E-mail address left in at request of witness. astronomers calculated the asteroid's size, mass, speed and vector. square miles of Siberian forest in the early twentieth century. astronomers to identify all 1000 meter near-Earth objects by 2012.
look at, but only thousands will be threatening," explained Prof.
desire to identify possible threats. Subsystem at NASA, Burns studies the characteristics of Saturn's rings. hopes to account for this fact. "It's like looking at a sunset," he described. "The sun casts a shadow that reveals the vertical undulations of the ring." Due to Cassini's optimal placement in orbit, the team surveyed an ambiguous structure. telescopes to identify near-Earth objects. which allows us to predict the orbit into the future," he explained. 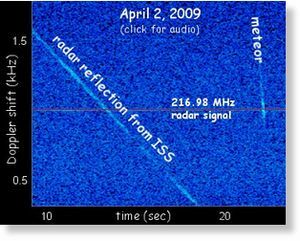 Arecibo's continued importance toward identifying near-Earth objects. tremendous loss for asteroid science." In recent years, global efforts have pushed to construct new telescopes, such as the Large Synoptic Survey Telescope. "There's a lot of activity going on in the area," Campbell affirmed. weight at the end to deflect its orbit, a U.S. scientist has suggested. Earth, rather than impacting it." NASA has identified over 1,000 of potentially dangerous objects nearing the Earth, and the number is growing. Asteroids won't raise killer waves - but mind the splash? almighty splash such an impact could create. splashing down in the ocean and triggering a powerful tsunami. do not after all pose a major tsunami threat. Comment: Asteroids that do not strike in the ocean pose a different kind of threat. water: they start breaking immediately, like ordinary waves on a beach. long wavelengths and characteristic periods of 8 minutes or more. 2 minutes, says Gisler, and so far less penetrating power. says. "But nevertheless one of these is going to come at us." Comment: For an in-depth study read: Meteorites, Asteroids, and Comets: Damages, Disasters, Injuries, Deaths, and Very Close Calls. A cosmic visitor created a brief spectacle over the pre-dawn Wise County skies Friday. a.m., or roughly a half-hour before sunrise. Daybreak motorists on U.S.
harmlessly onto field or forest. likely a meteor, he said. "There are probably two (meteorites) per day all over the globe," Undrieu said. A little-known fact is that the Earth's mass grows by an estimated 40,000 tons annually from stuff that falls from space. the atmosphere, or more or less a yard thick. Although he teaches physics, Undrieu said he occasionally teaches an introductory astronomy course at UVa-Wise. sky spectacle of a meteoroidal kind. came from and we finally lost sight of it!! It was in sight for about five minutes or so, we do have a little footage of it on a mobile phone but not that great..
Did anyone else see this and what was it?? but there is no confirmation yet what the object may have been. One resident reported to KBTX-TV she saw the object above the Kroger store in College Station. Another reported seeing it while driving on Wellborn Road in College Station. A resident also saw it in Madison County. past University in College Station when she saw the fireball. McLennan County all the way to Austin. Pieces of the meteor have since been recovered in the West area. and a meteor passed through the beam in quick succession. basic physics of the doppler shift is the same in both cases. Click on the dynamic spectrum to listen. and various Earth-orbiting satellites pass over the radar facility. Tune in! A mysterious "boom" that resounded across Vancouver, Washington early Friday may have been an extraterrestrial wake-up call, theorizes a geophysicist with the U.S. Geological Survey in Vancouver. geophysicist with the Cascades Volcano Observatory. Local gravel quarries reported no activity, especially at 6 a.m.
in a story on Saturday, experts ruled out some of the obvious theories. emergency managers know, nothing exploded on the ground. atmosphere miles above Vancouver. He said these arrivals are surprisingly common, though normally not in such a densely populated urban area where it's experienced by so many people. People generally reported the noise in an area of no more than about 10 miles, from west Vancouver to Hazel Dell and Orchards. If it was any bigger? "Portland wouldn't be here," he said. one: no radiation," he wrote in an e-mail. Wynn recalled witnessing one by happenstance while in the midst of a fierce sandstorm on the Arabian Peninsula in 1994.
flash penetrated the total darkness. rocks can do worse than create a loud noise or an interesting flash. post was assembling barrels with his back to the action. blast hit him and knocked him end over tea kettle." their cabin and nursed him back to health. be much smaller and composed of stony material rather than dense iron. "If people find pieces of this thing on the ground, it will have a burned and pitted look," he said. It's clear a 170-pound black boulder doesn't belong embedded half-a-foot into a sandy loam field north of Livingston. time residents saw a fireball burning in the Central Valley sky. The missing piece of information should be known in a few weeks, if not sooner. not, the suspense is worth the time and effort. For example, magnets stick to most of its surface. Part of its crust is melted and smooth. The grass is stained around it. was a rock about the size of a microwave. He called over McAlwee, who wasn't sure what to make of it. wasn't there. It would've mangled his mower blade. After pondering a few theories, he wondered if it could be the remnants of the fireball seen in the night sky Dec. 27.
that they've discovered any pieces of it. It remains to be seen whether this is from that event or some coincidence. McAlwee sent a walnut-size sample to Eric Whichman, a San Diego resident who runs meteoritesusa.com. He'll also look for round mineral patches called chondrules. If both those pan out, he'll ship the sample to a lab for tests. "We're taking a wait-and-see attitude," Whichman said. it's not a space rock. If it turns out to be a meteorite, he said he'll visit Merced as soon as he can. If it's not, he still wants to spend some time looking for any meteorite left by the fireball. Regardless of how this mystery turns out, McAlwee looks at discovering the rock with a philosophical bent. "Everyone lives between their alarm clock and their next meal,"
In other words, between a rock and a starred space. like a fire ball moving at a steady space. It was really weird". recently. There was even an 'encounter' in Eccles last year. the 'bright orange light' please register it at UK UFO Sightings. calls and reports of a "car-size ball of flame." and really big exploded and disappered quickly. Angle of Decent In Degrees: 45 ? Texas, US: Something Streaked Through The Morning Sky Monday, But What Was It? there is no confirmation yet what the object may have been. just past University in College Station when she saw the fireball. in an e-mail to News 10. US: Meteor strikes Flagstaff area? There have been reports of a possible meteor crashing into Earth early Sunday morning near Flagstaff. Multiple people called police saying they saw a car size ball of flame crashing to Earth. was exceptionally bright for a meteor," Hall told KTAR. Halls' neighbors are members of a search and rescue crew. They said a chopper crew on duty reported being "blinded" by it. According to Hall, there may have been more than one object. pieces of whatever it was coming in." Hall went on to say he doesn't believe a meteor the size of a car could even make it through the atmosphere and hit Earth. what it's made of and whether it fragments in the atmosphere or not." There have been reports of sightings as far as the four corners area and well into New Mexico. Despite the multiple calls, crews from Sedona to Flagstaff have yet to find anything. it's only a matter of time before one is found to be heading our way. some quarters very much would like it to remain that way." 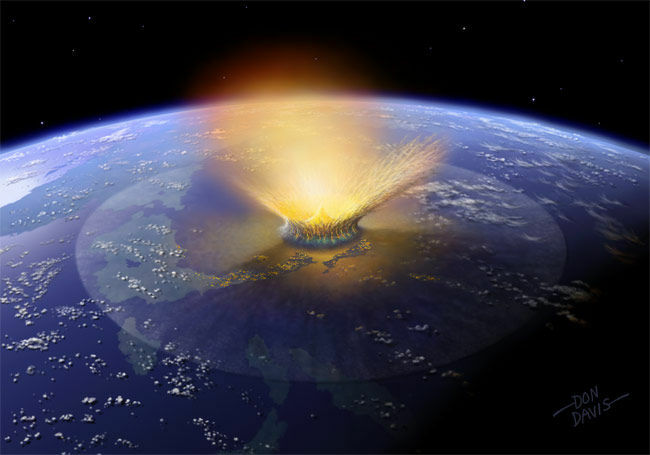 legal fallout from a potential asteroid threat. nudge the space rock aside for a near-miss or simply blasting it apart. 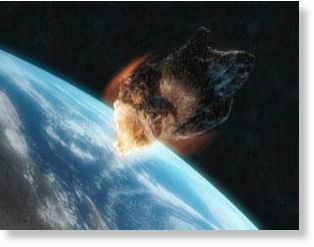 asteroid," von der Dunk told SPACE.com. held responsible for damages to Iraq under Security Council mandate. put a communications satellite into orbit in April, and would almost certainly require assistance from the U.S., Russia or China to deal with an asteroid threat. more precise estimate of the risk - which turned out to be much lower,"
Earth in 2029, but later refined chances of collision to almost zero. purpose of extracting mineral wealth from space rocks. evidence of ancient volcanoes are among the findings. 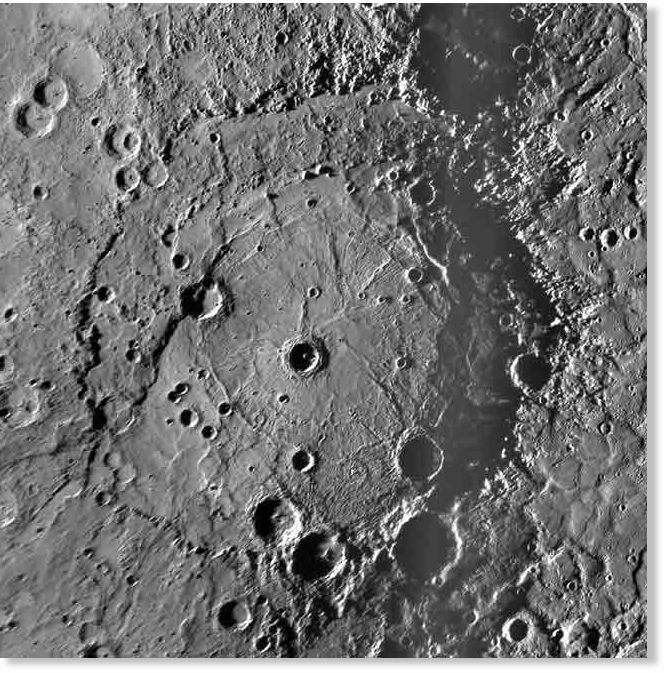 The photos show a giant impact crater that spans a length equivalent to the distance between Washington, D.C., and Boston. played less of a role in forming the moon's crust. through 11 color filters ranging in wavelength from 430 to 1020 nm. 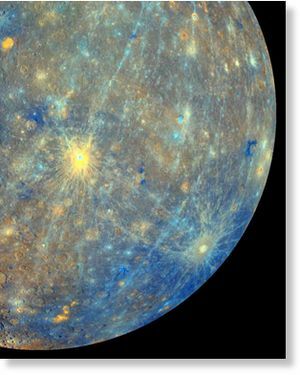 lead author of a paper in the May 1 issue of the journal Science describing MESSENGER's new global map of Mercury. 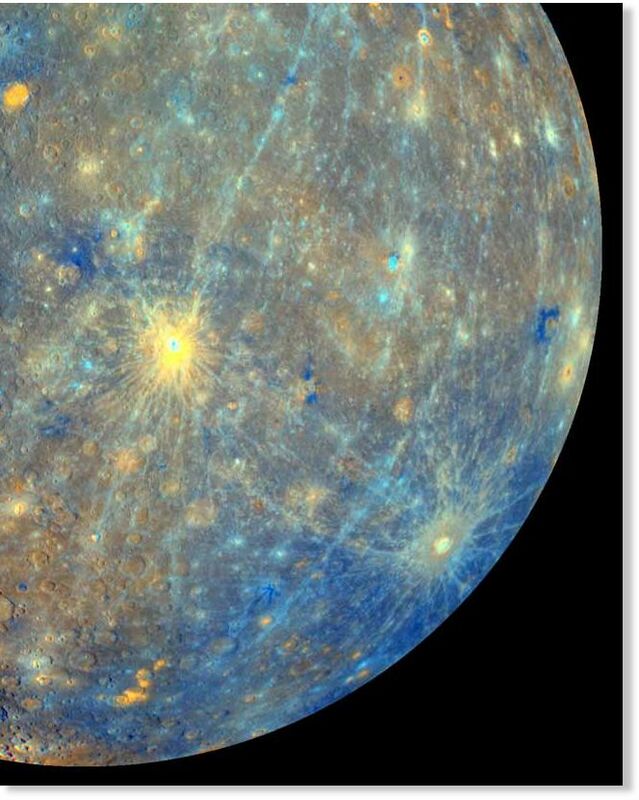 In fact, Mercury's surface now appears to be more similar to that of Mars than of the moon. volcanic lava, as most craters have been. 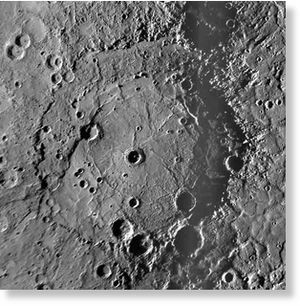 of a paper describing the crater in the same issue of Science. "Terrain like this is usually completely buried by volcanic flows." central solar system," Watters said. before setting into orbit around it. 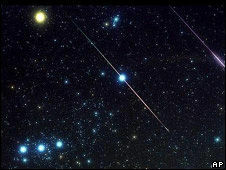 Today Oct 8, 2011 Meteor Shower. Nov 8, 2011 Asteriod. IMPORTANT NOTICE TO ALL THAT LIVE BY THE SEA OR OCEAN SHORE AT 1 FOOT TO 50 FEET ABOVE SEA LEVEL. Or with in ten miles of the coast. World Wide. This will be a very close call i pray it is only that. Discovered on December 28, 2005 by Robert McMillan of the Spacewatch Program A potentially hazardous Asteroid known as 2005 YU55. This Asteroid some what Large 400 meter-sized type – C, will pass by the Earth right between our moon and Earth. On November 8, 2011. The people on Earth have not seen a Asteroid of this size in advance. One this big Has not impacted Earth in over at least 4 thousand years. Most Objects that have a diameters over 45 meters or 147.637 ft strike the Earth approximately once every thousand years or so. Lying flat everything for hundreds of miles. Like the TUNGUSKA 1908 SIBERIA, RUSSIA CRASH OR Tunguska Explosion. This one did not even hit the Earth with its full Impact, it burst high in the air above the ground plowing it apart into many smaller parts. Making thousands of very deep holes in the Russian forests. Many of them in dense forest far from any roads or towns. One 400 Meters 1,312.3 ft in diameter like this one YU55 weighing millions of tons would if impacted Earth on land would darken all of the Earth not for just days but much longer. It would change the weather not seen on Earth in over thousands of years a massive climate change to say the least. Asteroids in our Asteroid Belt that is between the orbits of Jupiter and Mars do have collisions and some do turn into meteoroids many in the past thousands of years have come into the Earth's Atmosphere. Many of thousands of them make it into Meteorites the signs are all over the Earth, craters of all sizes. The World and NASA will watch this one very closely. Most likely more Earthquakes and the Oceans Tide will be strongly affected just from a near miss. Explosion In Scottish Forest - Meteorite Impact?